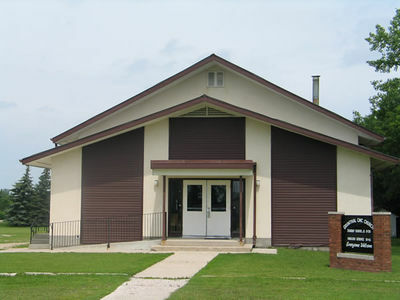 The Grunthal Chortitzer Mennonite Church in Grunthal, Manitoba began services in 1882. The congregation has been affiliated with the Chortitzer Mennonite Conference. The language of worship is English and Low German; the transition from German occurred in the 1980s. Pastor Cornie Wiebe served in 1996 as a congregational leader. In 1959 a group separated from the congregation and formed a new fellowship as a result of evangelistic effort in the area. Canadian Mennonite (7 August 1959): 1. Dueck, Gustav. Chortitzer Mennonite Conference : 1874-1990. Steinbach, Man. : Chortitzer Mennonite Conference, 2004. Epp, Marlene. "Grunthal Chortitzer Mennonite Church (Grunthal, Manitoba, Canada)." Global Anabaptist Mennonite Encyclopedia Online. September 1986. Web. 23 Apr 2019. http://gameo.org/index.php?title=Grunthal_Chortitzer_Mennonite_Church_(Grunthal,_Manitoba,_Canada)&oldid=142165. Epp, Marlene. (September 1986). Grunthal Chortitzer Mennonite Church (Grunthal, Manitoba, Canada). Global Anabaptist Mennonite Encyclopedia Online. Retrieved 23 April 2019, from http://gameo.org/index.php?title=Grunthal_Chortitzer_Mennonite_Church_(Grunthal,_Manitoba,_Canada)&oldid=142165.